Yes, it is true. Pearl still has not had her foal. She is now 14 days overdue. Pearl just kind of has milk. Nothing to write home about. She sure is taking her good old time with having this baby. I really have only been waiting about three years for it. The first year I tried to breed her she didn't take. Then the next year the stallion moved to Texas and Pearl got to meet him in person and still didn't take. Then she finally took that second year. And now this, an entire years of watching her belly get bigger and bigger. She just won't let it go. Her big fat baby belly is hanging down so far. It seems like her back would be hurting her. 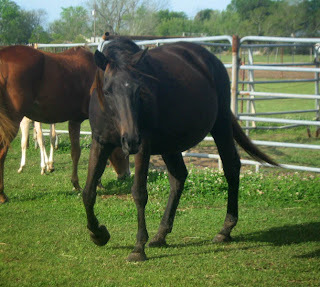 But yesterday I caught her trotting around the pasture. 12 months pregnant and she is trotting around the pasture like it's nothing. Really, I don't think her belly could get any bigger. These pictures don't to the size of her belly any justice. I really hope that foal isn't too big. I worry about that being that he is holding on to it for so long. I looked Pearl up on the American Paint Hose Potency charts last night. 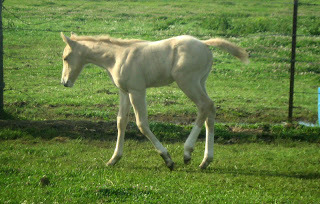 She has had three registered foals. 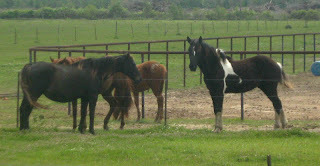 One was a black tobiano filly and the other two were Ozzie and Mac. The two solid foals that we had here. 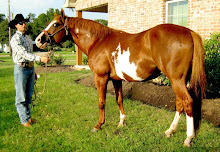 The stud we have bred Pearl to has been bred to three Thoroughbred mares before and two had solid paints and one has a palomino paint. So, I have about a 25% chance of getting a regular registry paint. Come on Pearl, show me the color!!! 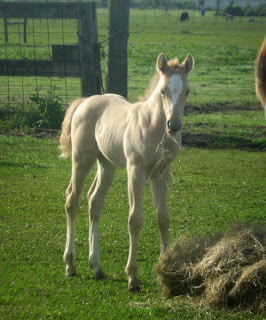 Blaze's filly is one week old now. How time flies. I turned them out with Pearl for a little bit yesterday. Blaze was happy to get some grass. The filly was so cute, copying her momma. She was pretty excited to be outside too. She investigated the pasture. Tried to see what all the fuss was about with this hay stuff. I then checked on them before I took a shower. The foal was sleeping and Blaze was eating. Then when I got finished showering and took a quick look outside, this is what I saw. Pearl! She was probably talking about me to the other horses. How I won't let her out in the big pasture. 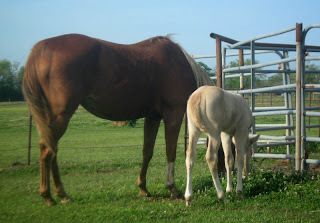 Or maybe she was getting some birthing coaching from the other mare. I am not sure, but Pearl looked like she was up to something. 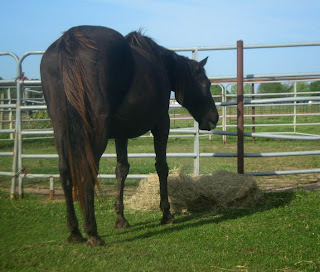 Then I looked over at my filly and she was on the outside of the fence. I didn't get a picture of it because I was too busy running over to my father in law's house to get some help with getting the filly back to her Momma. I finally got them back together and everyone was alright. Mr. Cowboy was all mad at me for turning them out. I put them back in the middle of the barn and put some more hay for them. The filly only had a few scratches on her nose and a little scratch on her shoulder. The one on her shoulder was really not much at all. I sponged off her little nose and put some medicine on it. She was doing fine this morning. Leave it up to me, to turn them out and something happens. 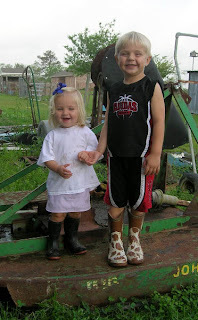 Today it's supposed to rain, so the two will stay in the barn. But tomorrow, if weather permits, I will turn them out in the big pasture for a few hours tomorrow. My two little helpers. They have been helping me clean up horse poop and raking sand. We put a bunch of sand in the middle of the barn yesterday. These two where right there to help. 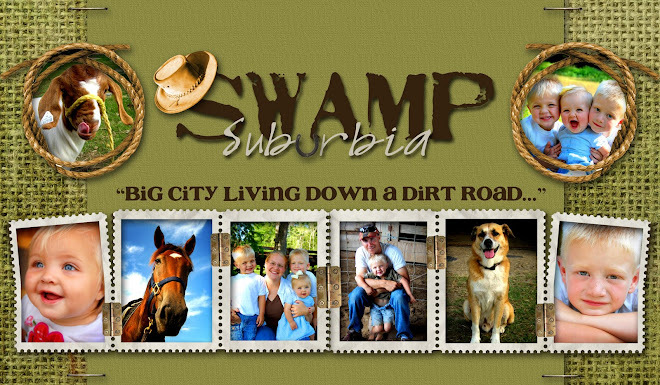 Today we are going to the feed store to get some de wormer and then back home to play with the filly. Here are some of the names that have been suggested, let me know what you think I am just trying to find her a fun barn name! Tinkerbell call her Tink, Sugar Cookie call her Sugar, Scoops as in Ice Cream Scoop, Tater as in Tater Tot, or I could call her Tot, Gayle for Gayle force winds that come with tornadoes, but that is all I have got, with help from some of my readers and ones that I thought of. Tater Tot I thought of this morning!! I think Pearl and Rumba has some freaky horse telecommunication thingy going across Texas to one another. I swear Rumba looks ready to pop- and yet I caught her looping - LOOPING for crying out loud! - across the pasture yesterday. Her belly is like a continent of it's own! Baby is kicking the crap out of her regularly too. All I can think about is the movie Billy M@dison and when he's like, "it's gonna be a soccar player...he is!" Sheesh...Pearl is looking mighty huge out there. 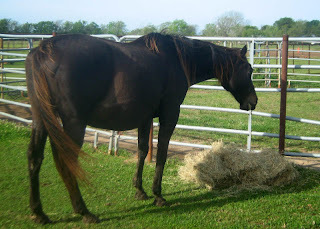 Maybe turning her out with Blaze and her foal will stimulate that baby to come out...lol!!! That filly is growing up nice too. She looks like a little Sprite! Have fun with her and smooch on her from me! 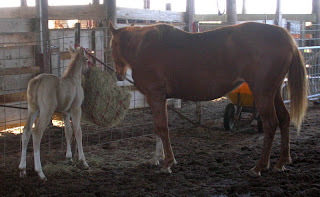 Think positive, the law of averages says she can't hold on to that foal much longer, somethings got to give. Okokokok... I don't know about this baby, but I think you should name Pearls baby Ruby if it's a girl! That filly sure is cute. I like the name Tink. That picture of her with the hay in her mouth is priceless. Pearl looks like she's gonna pop! Poor mares look so uncomfortable towards the end. When mine was pregnant, she used to rest her chin on the fence. Hopefully we'll hear baby news soon. Good luck on gettin' some color. And that filly is so good lookin' already! That baby is too freaking cute...... Thanks so much for sharing. Pearl looks about ready to pop anytime! I can't wait to see if the baby is colored! What a fun little guessing game it must be, breeding Appy's and Paints! Wow! Pearl is HUGE! Reminds me if when I was prego with my twins and then my 11lb 12 oz daughter! I surely wasn't skipping around at the end of those pregnancies. lol! 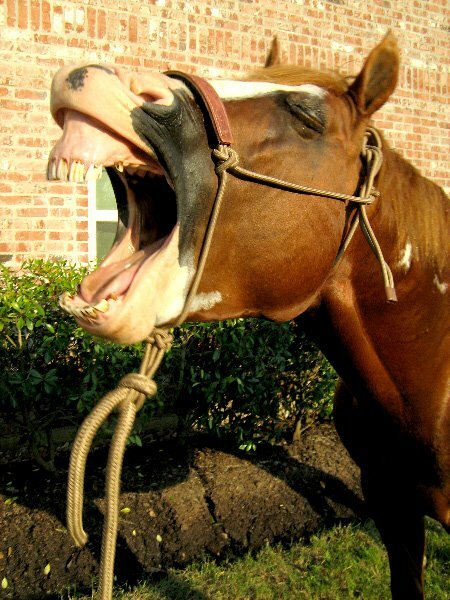 Thanks for including all the prego horse pics, too. It's so exciting. 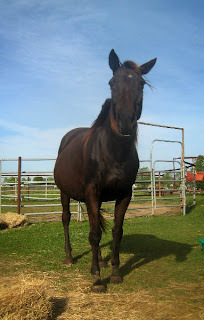 And I'm looking forward to Val's mare giving birth in 3 months. I agree a couple more weeks! I say around Easter, you know our last cold snap! You know how they are! She is huge! Poor girl! HMMM barn name~nothing off the top of my head, it'll come though! And then like Ron White will you call her "the Tater"? LOL! Such cute pics! You are bringing back such great memories for me. Tink is cute. So is Scoops. That has to be tough giving the perfect name to such a cutie pie. I'm excited to see your new addition. Hurry up already!